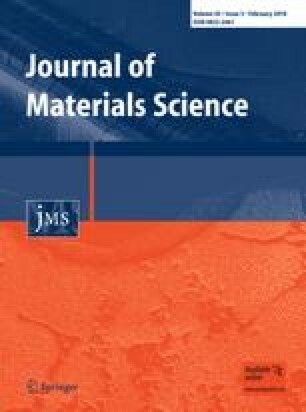 3-3 Interpenetrating composites, consisting of 3-dimensionally interpenetrating matrices of two different phases, are interesting materials with potentially superior properties when compared with traditional metal matrix composites. In the present research, gel-cast Al2O3 foams with open porosity in the form of spherical cells connected by circular windows were pressurelessly infiltrated using an Al-8 wt% Mg alloy. Electron backscatter diffraction (EBSD) analysis revealed that the alloy had a large grain size with single grains generally inhabiting multiple cells. The flexural strength of the composites, tested using 3-point bending, was ~350 MPa, rather high when compared to other Al-alloy-based Al2O3 composites. The strength increased with both decreasing foam density and cell size. The reasons for the high strength are good metal–ceramic interfacial bonding, crack bridging by plastic deformation of the metal phase and crack deflection. The authors gratefully acknowledge funding from the EPSRC, UK and Dyson Thermal Technologies, Sheffield, UK, for supplying the alumina foams.